Casa Volcan is a stunning split level villa which has been decorated to a high standard with hand picked furniture from around the globe. This villa is set in the tranquil village of Tabayesco which has beautiful outlooks to the surrounding mountains and the atlantic ocean. La Garita Beach at Arrieta is just 1km away and is ideal for swimming or enjoying a meal at local restaurants, which are open all year round. This unique villa sleeps up to 12 guest, and with its sea views and large space, makes an ideal holiday home for family and friends to get together. Although perfect for bigger groups to socialise, there is also a good level of privacy for when you need quiet time. The entrance hall is open plan to the fully fitted kitchen and breakfast bar, and the modern kitchen is fully equipped for all of your self-catering needs and comes complete with oven/induction-hob/grill, dishwasher, fridge, freezer and microwave. Four of the villas bedrooms and two of the shower/wet rooms with WC and sinks, are accessed from this main hallway. The large master suite has outstanding panoramic sea/mountain views through its double patio doors and floor to ceiling windows. The upper level of the suite has hard wood floors and a king-size double bed with access onto the wood decked terrace and further large sun terrace. The lower level of the suite boasts a large walk-in wardrobe, open-plan free standing bath on marble floor, shower and sink. There is a further en-suite shower/wet room with second sink and WC. The second bedroom has twin beds overlooking the sea view from floor to ceiling windows. The third bedroom also has twin beds and overlooks the top garden. The fourth bedroom also overlooks the top garden and has flexibility of up to 3 guests in its double bed with additional single top bunk, ideal for children. From this upper hallway level you pass though double sliding doors and carry on down the wide outdoor covered stairs. Here you come onto the open sided terrace-room with ping-pong table and dining table along with a day bed of authentic Moroccan sofas. This shaded terrace overlooks the villas middle garden, hammock and BBQ area. Following on down 3 more steps you access the spacious open plan living-room. This is flooded with light and boasts magnificent sea views. 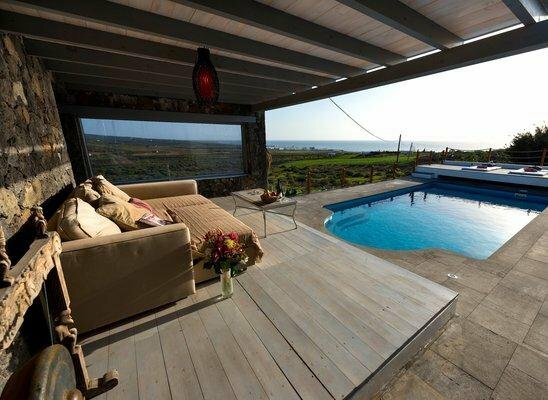 It has a large patio sliding door which opens out onto the solar heated pool and lava/decked terrace. The fifth bedroom and fourth shower/wet room are both accessed from the living-room. This bedroom is ideal for a couple with its kingsize bed (160cm) and views over the chill out pool area and on down to the sea. The shower/wet room has access to the natural sky light and is complete with WC and sink. The sixth bedroom with sea views from its king-size built in bed, is accessed exclusively from the pool area through a hydraulic wooden trap door, it is sub-terrain so ideal for teenagers or couples. Outside by the pool, enjoy the tranquil surroundings and uninterrupted sea views from the covered shaded chill out terrace, which overlooks the 8x4 metre solar heated swimming pool. There is a separate laundry room with washing machine which is accessed from the top garden and the villa comes complete with flat screen TV with USB ports and HDMI ports, docking station, safe and wifi (perfect to keep gaming teenagers happy). Note: We feel that it is necessary for people with children, to be aware that the wide stair case can be closed off from the entrance hall by its glass door, but there is no stair gate from the dining area. In addition, non swimmers need to be aware of the pool and its proximity in relation to the living-room. The price per night is based on up to 4 guests sharing Casa Volcan. During high season, this is increased to 6 guests. There is an extra charge of 25€ per person per night for additional guests.